This elementary-level book is carefully structured to help students learn their theory in the most beneficial way – by playing, writing, and combining it with ear training at the same time! 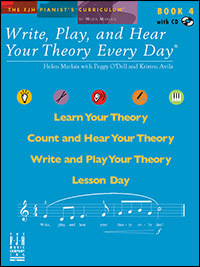 Students are asked to write answers to theory examples, play them, and then reinforce each concept with ear training. The manageable task size and format of each unit makes progress immediately noticeable, which helps motivate students. Includes recordings that can be used at the lesson or at home to further reinforce students' knowledge. Designed as a companion to the student book, the teacher's Answer Key provides correct answers for each of the written exercises as well as playback and ear training activities. The "Lesson Day" activity is an excellent way for teachers to see the progress students are making! 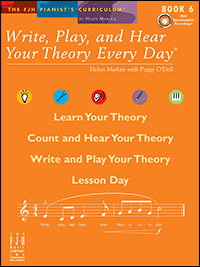 Book 2 in this series continues helping students learn their theory in the most beneficial way–by combining it with ear training at the same time, which promotes well-rounded musicianship. 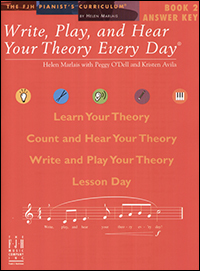 In this book, students learn more notes on the staff as well as intervals, half and whole steps, major and minor five-finger patterns, key signatures and more. There is an entire unit on music analysis as well as a final test. It is here that students synthesize everything they have learned throughout the book. 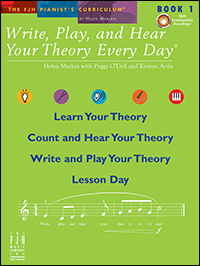 As in Book 1, every unit includes a multitude of activities such as: writing, playing, and listening; "Count and Hear Your Theory"; "Write and Play Your Theory"; Lesson Day activity; and a CD to reinforce every unit, which can be used at home or at the lesson. 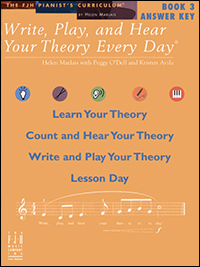 The Answer Key is the companion to Write, Play, and Hear Your Theory Every Day®, Book 2, and provides the correct answers for each of the written exercises as well as playback and ear training activities. The "Lesson Day" activity is an excellent way for teachers to survey their students' progress. 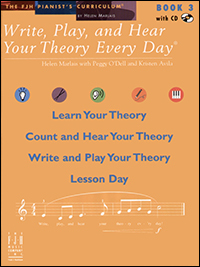 Book 3 in this series introduces new concepts such as: ledger lines; intervals up to an octave; major one-octave scales beyond C, G and F major; naming major key signatures; dotted quarter notes; octave signs; 1st and 2nd endings; and additional music vocabulary. Students are presented with a final test at the end of this book to demonstrate their knowledge of concepts presented in this level. Includes recordings to reinforce every unit, which can be used at home or at the lesson. 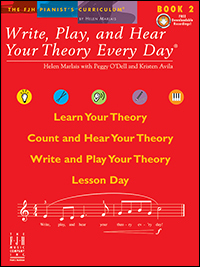 The Answer Key is the companion to Write, Play, and Hear Your Theory Every Day®, Book 3, and provides the correct answers for each of the written exercises as well as playback and ear training activities. The "Lesson Day" activity is an excellent way for teachers to survey their students' progress. Book 4 in this series introduces new concepts such as: new time signature 6/8 ; relative minor scales; key signatures for major and minor scales; primary triads and the dominant 7th; subdominant and dominant 7th chords; authentic, plagal, and half cadences; among others. Students are presented with a final test at the end of this book to demonstrate their knowledge of concepts presented in this level. Includes a CD to reinforce every unit, which can be used at home or at the lesson. 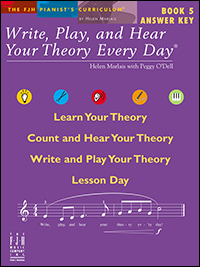 The Answer Key is the companion to Write, Play, and Hear Your Theory Every Day®, Book 4, and provides the correct answers for each of the written exercises as well as playback and ear training activities. The "Lesson Day" activity is an excellent way for teachers to survey their students' progress. In Book 5, students will review Major and minor key signatures, time signatures, notes and rests, Major scales, relative minor (natural and harmonic) scales, intervals, triads and inversions, and cadences. New material includes: 2/2 time signature; naming sharps and flats in Major and minor scales; sixteenth notes and rests; eighth note triplets; Major and Perfect intervals; primary triads and the sub-dominant and dominant 7th. Includes Music Analysis, and a final test. 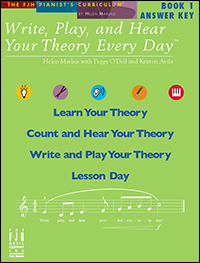 The Answer Key is the companion to Write, Play, and Hear Your Theory Every Day®, Book 5, and provides the correct answers for each of the written exercises as well as playback and ear training activities. New concepts are: Major, Perfect and minor intervals; 9/8 time signature; sixteenth and eighth note combinations; primary and secondary triads; dominant 7ths; transposition; compositional techniques of repetition, sequence, and imitation; and non-harmonic tones (passing and neighbor). Complimentary download of ear-training examples and answer key is available online. Contains several musical analyses and a final test.